Raw materials are weathered edible corals from the South China Sea. Coral has been used as traditional medicines in China. Coral is washed and desalinated by water for long time, moreover it is reduced under heated hydrogen gas. We are ready to supply fresh materials at any time. Under collaborative research with National University Corporation Kitami Institute of Technology in Hokkaido, we succeeded in ventilating and heated hydrogen gas in the weathered edible corals after burning as hydrogen absorption coral powder (HACP). Our company may deliver you as the manufacturer and wholesaler. 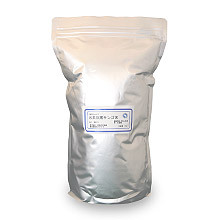 It may be used various as materials of supplement, processed foods and cosmetics.